April is the first month in many parts of the country that it's warm enough to grow vegetables. Check with the university agricultural extension near you to see when the average dates of the last frost are. Plan to plant your seeds a week or two after that date. Dig the soil to a depth of 12 inches and add compost and slow-release fertilizer. April is still chancy for frost. Cover the seedlings with clear plastic cups, glasses or jars if frost is in the forecast. 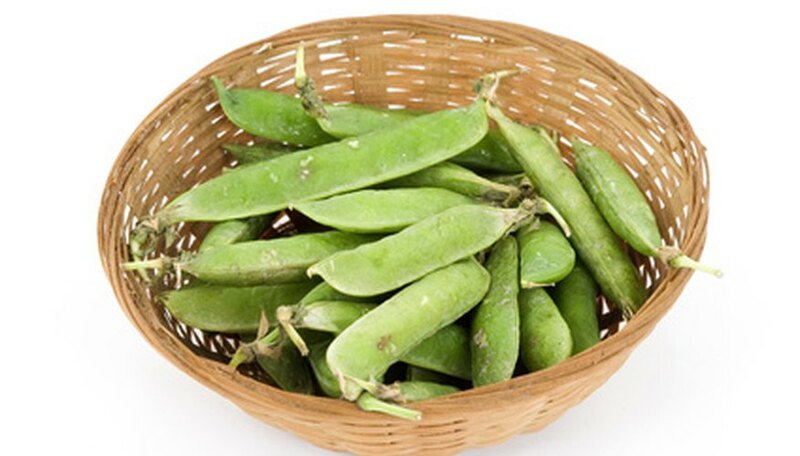 Snow peas have edible pods and are tasty raw in salads or lightly cooked in stir fry dishes. If left on the vine the pods will mature and fill with peas. English peas have a tougher pod that is removed when the peas mature. If you have a bumper crop of peas, freeze them or dry them for use later. Dig a trench 6 inches deep. Add 3 inches of compost. Cover the compost with 2 inches of garden soil. Plant peas 2 inches apart and cover with the remaining 1 inch of soil. Peas grow to 6 feet tall and will need netting or some other support to cling to and grow upward. Lettuce includes leaf lettuces like oak leaf, butter crunch and mesclun. They form loose heads as the leaves grow in a circular pattern around the center. Harvest leaf lettuces as soon as they are a few inches long by snipping them off the plant. Head lettuces include romaine and iceberg. Harvest when the head is fully packed. Head lettuces have a tendency to bolt faster than leaf lettuces when the spring weather warms up. Sprinkle the seeds over the soil and cover with 1/8 inch of soil. Some leafy greens like kale and chard are tolerant of a light frost so they're good to plant in April. Choose a sunny location for faster growth in spring. A partly shady location works for summer but is too cool for early spring. Other greens to plant include spinach and mustard. Plant leafy greens the same as you would plant lettuce. Plant carrots, beets, rutabagas and parsnips in April. They require a long, cool season to mature to their full size. Harvest root vegetables at any time they're big enough to eat. Carrots as tiny as an inch long are edible and are sweeter than when fully mature. Plant in rows and thin to an inch apart for carrots and 2 to 3 inches apart for the other root vegetables.